“you not just click the moment we create a long lasting memory”. No matter if you’re shooting from a mobile camera phone or a DSLR, if you really care how your photos look, you’ll want to import them into your PC to organize them and then go through all the click and select the best and perfect them with some photo editing software. Either it’s for professional or personal use. Here are the best Free Photo editing software 2017. There’s no argument about it — Adobe Photoshop remains the best photo-editing software on the market. But unless you’ve undergone formal training, it’s a difficult program to master, also expensive to design or create the photo with eye-catching filter edits. There are many free photo editing software that turns your image into the professional count. So you’ve graduated from smartphone photography tools and edit with normal apps or like those offered by Instagram and Facebook. Does that mean you have to pay a ton for high-end software? We’ve included all levels of PC software here, however, given description makes easy which is for you. 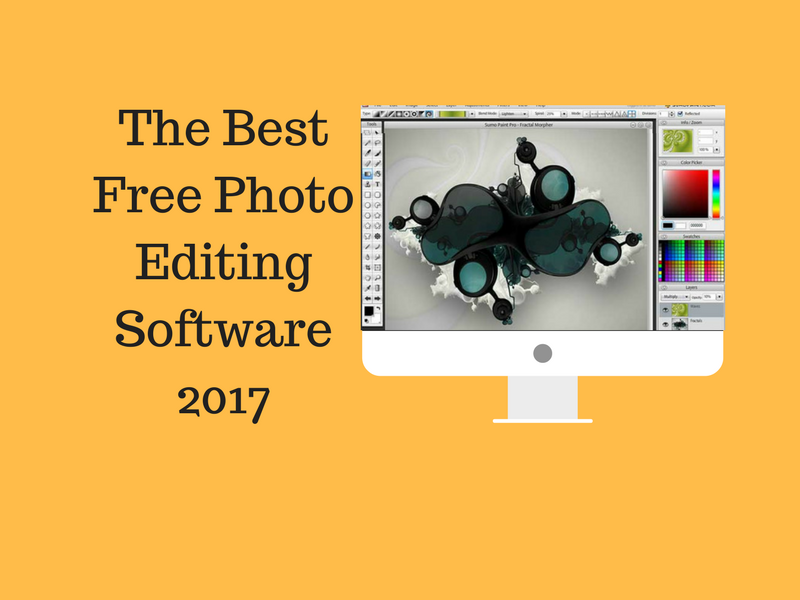 A free photo editor that’s a worthy rival to premium software. Pixlr is a cloud-based set of image tools and utilities, including a number of photo editors, a screen grabber browser extension, and a photo sharing service. It can be used on PCs, and on smartphones or tablets using a mobile app. When you go to Pixlr’s website, you can choose to use Pixlr Editor or Pixlr Express.Pixlr Editor enhance your image with photo editing features that are similar to Photoshop like cropping, resizing, and changing the color of the entire image.while Pixlr Express suited for applying filters, texts, and other overlays effects to a photo.The desired Extension can be applied to save your edited image as JPG, PNG, BMP, TIFF, and PXD (layered Pixlr image). 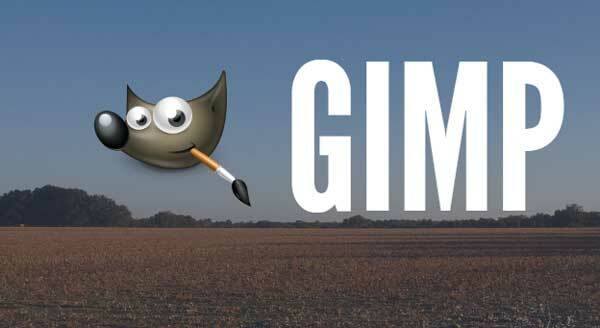 The best free alternative to Photoshop, GIMP (GNU Image Manipulation Program). GIMP has a Photoshop-like interface, cross-platform image editor available for GNU/Linux, OS X, Windows and more operating systems. It is an open-source application, you can change its source code and distribute your changes. Once you launch the program, you’ll find icons in the toolbox represent actions such as the crop, lasso, paint and brush tools, and you can apply various effects to your photos. 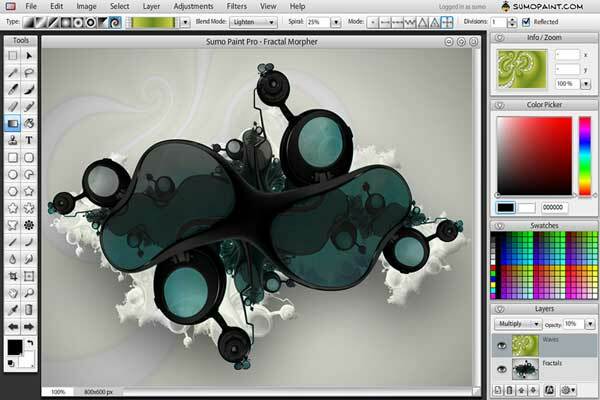 SumoPaint is another free online and desktop photo editor without a need to install anything on your device. It’s the most versatile photo editor and painting application that works in a browser. You can open and save images from your hard drive or save it to cloud. The toolbox contains features like brightness/contrast, hue/saturation, color balance. It is also useful in creating simple logos using the text and brush tools. 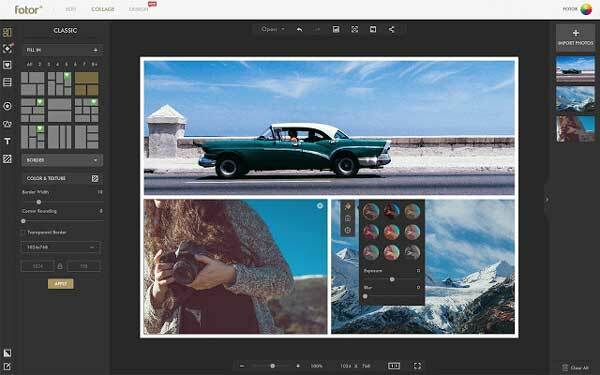 Fotor Photo Editor is another free online designer and editing tool catering to all your photographic and image creation needs! Add filters, frames, text, and stickers. It is very simple and intuitive to use also makes quick work to photo editing task. Photo editing with a powerful digital editing with basics as resize, crop, straightening and with a huge range of filters and effects. To express more feelings than a single image can contain it provides a photo collage photo stitching to funky collage and other filters. Perfect graphic design, when you are running with your twitter covers, youtube channel art, facebook covers, Instagram post etc. To enhance an image with different levels of light exposure, bringing out deeper color, greater details, and all-rounder better image it creates HDR images. Blemish remover, wrinkle remover, photo reshaping, red-eye remover and teeth whitener brush up by beauty retouching to create someone very special and let the world see them at very best. 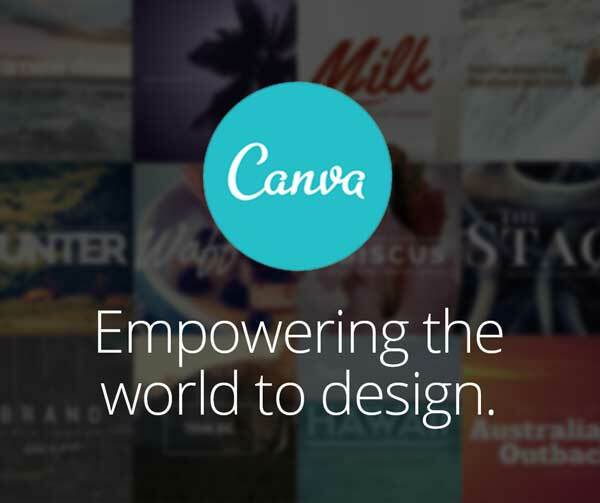 Canva is a free graphic-design platform used by non-designers as well as professionals. Enables easy to use drag-and-drop interface, provides access to over a million photographs, graphics, and fonts. Create designs for blog graphics, presentations, Facebook covers, flyers, posters, invitations on social media (Facebook, Twitter, Instagram, and Pinterest). Canva is available on your iPhone, iPad, and computer so you can create, edit and share your designs when it suits you most.